The region extending across northern Norway, Sweden and Finland is sometimes called Lapland, and it is home of the Sami people. For centuries, the Sami depended on the reindeer for food. Life in this harsh environment would not have been possible without the Spitz dogs which helped the Sami hunt, and later herd, the reindeer. Eventually, these herding Spitz type dogs developed into three breeds, the Swedish Lapphund, the Lapponian Herder, and the Finnish Lapphund. The Finnish Lapphund is the original native breed, and is still used today as a herding dog. The breed first came to the United States in 1987. 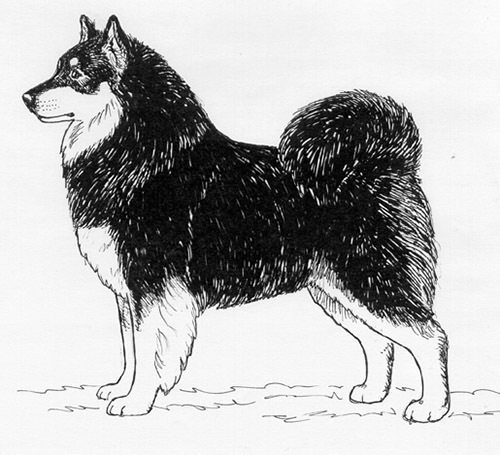 The Finnish Lapphund was recognized by the United Kennel Club in 1994. The Finnish Lapphund is a medium-sized, sturdily-built, Spitz-type dog with a profuse double coat and a nearly-square body. The high set tail is of medium length, covered with long hair, and carried in a curl over the back when the dog is moving. The Finnish Lapphund comes in all colors, but a single color must predominate. The breed is presented in a completely natural condition except for trimming around the feet and hocks to neaten the appearance. The Finnish Lapphund is a working dog, capable of herding reindeer all day. Deviations from the standard are to be penalized to the degree they affect the dog’s ability to work. The Finnish Lapphund is intelligent, willing, affectionate and adaptable. They have natural herding instincts and a tendency to bark which can be diminished with training. They make excellent watchdogs that will bark at strangers, but lack any tendency toward aggression. Finnish Lapphunds live very easily with children and other dogs. The head is wedge shaped, rather broad, and strong in outline. The skull is slightly longer than it is broad, and as deep as it is wide. It is arched, with a rather domed forehead and a well defined frontal furrow. There is a well defined stop. The muzzle is strong and broad, with a straight nasal bone. It tapers slightly, but evenly, from the stop to the tip when viewed either from the front or from the side. The lips are tight and the cheeks are clearly defined. The Finnish Lapphund has a complete set of evenly spaced, white teeth meeting in a scissors bite. Preferably black, yet harmonizing with the coat color. The eyes are rather large and oval-shaped. Dark brown in color, but harmonizing with the color of the coat. Expression is intelligent and kindly. The ears are medium sized, broad at the base, set rather well apart, and triangular in shape. They are very mobile. The ears are carried either erect or semi-erect. The neck is of medium length, giving a sturdy, muscular appearance. The neck is free of throatiness and covered with a thick ruff of hair. The shoulders are slightly oblique, and form a moderate angle with the upper arm, which is equal in length to the shoulder blade. The upper arm lies close to the ribs, with the elbow placed just below the bottom of the ribcage. The forelegs are well-boned, straight and muscular, with medium length, slightly sloping and flexible pasterns. The length of body, measured from prosternum to point of buttocks, is only slightly longer than the height, measured from withers to ground. The body is compact, deep, and flexible. The topline is moderately short and level. The ribs extend well back and are moderately sprung out from the spine, then curve down and inward to form a deep body. The forechest is well developed. The brisket extends nearly to the elbow. The loin is short, well muscled, and broad. The croup is proportionately long and broad, slightly sloping, and muscular. Belly is slightly tucked up. The hindquarters are strong and muscular, the upper thigh broad, and the second thigh long and sinewy. The rear legs are well boned and moderately angulated at stifle and hock joints. The hocks are well let down. Viewed from the rear, the rear pasterns should be parallel to each other; from the side, they should be perpendicular to the ground. The feet are of oval shape and compact, with well-arched toes and thick, elastic pads. Feet should be covered with thick hair. Dewclaws may be removed. Excess hair around the feet may be trimmed. The tail is set rather high, and of moderate length. When the dog is alert or moving, the tail is carried curled over the back or to the side. When the dog is relaxed, it may hang down between the legs. The tail is covered with long dense hair giving it a bushy appearance. The tip of the tail may have a J-formed hook. The profuse, dense, double coat of the Finnish Lapphund is essential to this breed’s ability to live and work in the harshest Arctic environment. The outer coat is long and coarse while the undercoat is short, dense, and soft. Hair on the skull and the front parts of the legs is shorter than the body coat. Hair on the brisket, backs of thighs and tail is longer. The hair on the cheeks, neck, and throat forms a protective ruff. All colors are allowed but one color must predominate. Markings of colors other than the main color are allowed on the head, neck, chest, legs, and the tip of the tail. A mature Finnish Lapphund male ranges in height from 18 to 20½ inches, measured at the withers. A mature female ranges in height from 16 to 18½ inches. The Finnish Lapphund moves freely with strides of moderate length, conveying stamina and agility. It is a quick, agile trot, which enables the dog to switch effortlessly to a gallop, which is the breed’s more natural gait. Correct movement is essential in this breed.